RAPAPORT... Two white lab-grown diamonds from De Beers’ Lightbox brand have G color and VS clarity, the Gemological Institute of America (GIA) said after examining the stones. Lightbox doesn’t offer grading reports for its products, and hadn’t previously publicized their specific quality characteristics. The GIA obtained the 0.24-carat and 0.26-carat polished stones from a “third-party vendor,” according to Sally Eaton-Magaña, a senior research scientist at GIA in Carlsbad, who published her findings in the Winter 2018 issue of the institute’s quarterly journal, Gems & Gemology. Both stones — intended for a pair of earrings — would have had VVS clarity had the Lightbox logo inscription not reduced their grades to VS, Eaton-Magaña observed. The smaller stone had Excellent cut, while the larger one was considered Very Good. “These samples [published by the GIA] are consistent with our expectations,” Sally Morrison, Lightbox’s chief marketing officer, told Rapaport News Wednesday. The brand occasionally tests some of its stones to ensure they fall within a predictable range, even though it doesn’t provide the grading information to consumers, Morrison added. The stones showed no sign of color treatment, unlike many other chemical vapor deposition (CVD) diamonds, the GIA reported. Most producers grow CVD layers quickly, leaving a brown color, knowing they can improve them later with High Pressure-High Temperature (HPHT), Eaton-Magaña explained. For that reason, about 75% of the CVD material in this color range that the GIA has examined to date had been through HPHT treatment following growth, she noted. De Beers has previously claimed that its decades of investment in synthetic diamonds have enabled it to offer Lightbox jewelry at the relatively low retail price of $800 per carat. One factor in that is its capacity to grow diamonds with good-enough color to sell untreated, Morrison indicated Wednesday. The company has no problem with other producers HPHT-treating their own synthetic diamonds, even without disclosure, Morrison argued. “This is already a manufactured product, and it really doesn’t matter how many stages there are to the manufacturing process,” she said. The stones were easily detectable as lab-grown, not just because of the Lightbox mark. Under spectroscopic analysis, they had very similar features to other CVD diamonds the GIA had previously tested, Eaton-Magaña said. Lightbox’s blue and pink stones — which form a large proportion of its product range but weren’t part of the GIA’s sample — are also readily identifiable as synthetic because they look significantly different from the equivalent natural diamonds, the scientist added. The GIA’s findings raise an issue about how it grades synthetics, with the institute revealing it’s considering changes to its system. 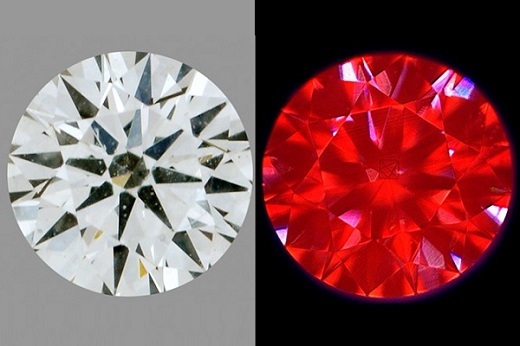 Though Eaton-Magaña said the Lightbox stones were equivalent to G color, the GIA doesn’t currently offer such detail in its grading reports for white lab-grown diamonds, providing only loose terms ranging from colorless (the top grade) to light (the lowest). Additionally, its clarity descriptions for synthetics don’t break down VVS, VS, SI or I into any subcategories. Plus, the name of the GIA document, “Synthetic Diamond Grading Report,” hasn’t always gone down well. Diamond Foundry, a large lab-grown producer, called on the institute to rethink its reports last year after the US Federal Trade Commission (FTC) removed “synthetic” from its list of recommended descriptors for lab-grown diamonds, and edited “natural” out of its definition of diamonds. “In the very near future, GIA will finalize and announce changes to our reports for laboratory-grown diamonds to align with the FTC guides and changes in the market,” Stephen Morisseau, the GIA’s director of corporate communications, said in a statement to Rapaport News Wednesday.